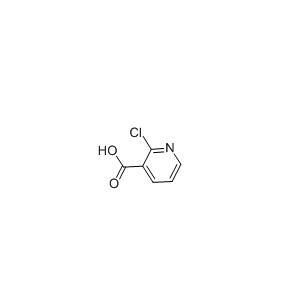 2-Chloronicotinic acid cas number is 2942-59-8, also known as 2-chloro nicotinic acid, has special physiological activity and is an important Pharmaceutical and pesticide intermediate for the production of agricultural herbicides, insecticides, pharmaceutical antibacterials, etc. . Therefore, he has high application value and market value. In recent years, with the development of pesticides and medicine, nicotinic acid series chemicals have drawn more and more attention and have a wide range of applications. As an important nicotinic acid series, 2-chloronicotinic acid cas 2942-59-8 is mainly used for the preparation of novel and highly effective herbicides nicosulfuron, anti-inflammatory analgesic niflumic acid, pranoprofen and HIV reverse enzyme inhibitor nevirapine. These products are in short supply at home and abroad. Therefore,strengthen the research on production process of 2-chloronicotinic acid has great significance. At present, the literature report about synthesis of 2-chloronicotinic acid is less in the country, there are three main synthetic routes: (1) use Nicotinic acid as the raw material to prepare nicotinic acid N-oxide, then take chlorination between the oxide and POCl3 to Prepare of 2 - chloronicotinic acid, due to the low selectivity of the second chloride and thus yield is more lower; (2) use 2-chloro-3-methylpyridine as raw material, mixed acid oxidation of methyl 3 was Carboxyl, the method requires harsh conditions, equipment investment is large, resulting in more waste water, it is difficult to industrialized production (3) 2-chloronicotinine as raw materials synthesis of 2-chloronicotinic acid, the method not only difficult to obtain raw materials, but also the process is immature, basically do not have the conditions for industrialization. (4) 3-cyanopyridine as the starting material, the production of N-oxide by hydrogen peroxide oxidation, and then use POCl3 as a nucleophilic to take substitution reaction, and finally hydrolyzed under alkaline conditions, through crystallization to get 2-Chloronicotinic acid. In the actual production is reference to the last method. At present, the reaction system of 2-chloronicotinic acid has the defects of low preparation purity and serious pollution of wastewater discharge. The wastewater discharged from 2-chloronicotinic acid production is mainly for the production of process wastewater and workshop flushing wastewater. Production wastewater includes oxidized centrifuged wastewater, chlorinated centrifuged wastewater and hydrolyzed crystalline centrifuged wastewater. Specific conditions are as follows: 1. Oxidative centrifugal wastewater is strongly acidic and high COD wastewater, the reaction molar yield of about 94%, so the wastewater contains a large number of unreacted 3-cyanopyridine. 2. Centrifugal chlorination wastewater is a high-phosphorus wastewater. Phosphate is produced during the non-chlorination reaction. The excess POCl3 is hydrolyzed to phosphoric acid when hydrolized. The molar yield of chlorination reaction is about 93%, so the wastewater is of high COD and high Phosphorus waste water. Due to the high phosphorous content of the waste water, lime is added to produce calcium phosphate precipitation. After centrifugation, the solid is sold to the outside for comprehensive utilization. At the same time, a large amount of flocs were formed during the sedimentation, and the flocs adsorbed macromolecule organic matter, but the effect of COD concentration as not satisfactory after centrifugation . Looking for ideal Agricultural Intermediate 2-Chloronicotinic Acid 2942-59-8 Manufacturer & supplier ? We have a wide selection at great prices to help you get creative. All the Pharmaceutical Intermediate 2-Chloronicotinic Acid CAS 2942-59-8 are quality guaranteed. We are China Origin Factory of CAS Number 2942-59-8. If you have any question, please feel free to contact us.